It sounds incredibly rich and thought-provoking for such a slim novel. Quite remarkable. I couldn't help but be reminded of another one of your posts as I was reading this - your piece on When the Mountain Fell. (And I see you've mentioned Ramuz on your commentary, highlighting a contrast between his use of Christian imagery and Giono's approach.) The Giono seems to be a little difficult to get track down in the UK, but I'll keep an eye out for it. Thanks, Jacqui - I thought this was a terrific little novel, one with a lot to chew on and one expect will stick with me for a long time. It's hard to think of other writers like Giono, though Ramuz did come to mind. But he doesn't have the depth and power of vision that Giono has, even though both seem to write presciently about the environment. Sorry that this isn't easy to find in the UK! I did not read your post carefully as I have not yet finished the novel. I will be back to comment more articulately, but I have little hope that my post will be as insightful as yours. Nevertheless, a discussion awaits us. I'm enjoying the discussion quite a lot and look forward to your joining in, Bellezza! Thanks for your detailed review. Interesting to hear of the influence of the classics - I would never have thought of that but it made sense when I read it. Also pleased to hear that you rate the translation as I thought it read beautifully - as you say, that strange combination of lyrical and economical. I'm so glad I joined in! I'm glad you joined in too, Grant - I've gotten a lot out of your post and Dorian's, and hope to see others. Initially I felt completely deflated with the translation after leaving off of Giono's French, but I recovered almost immediately and think, as I noted above, that it's a tremendous thing that Eprile managed to pull off. But the French is unbelievably exquisite. About every page I'd read some line aloud and just marvel at the language and then root around in Larousse to figure out the meaning of some word - and Larousse doesn't even have all of them. It is so interesting how some writers can squeeze so much into a small number of pages while others spread out just a few ideas over many. I love the emphasis on the power of language that this book seems to contain. I was really impressed by both Giono's thematic treatment of language and by his dexterity with it. He seems often to choose words that themselves have references to language. For example, in one scene, to describe a character beating a fire with a poker, he uses an archaic verb, "fouailler," which means "to lash or whip" - but it also has a secondary meaning, which is "to hurl invective or insults." It's interesting that the hill is initially described as non-menacing, as you quoted in the beginning of your post, but then later becomes an object to be reckoned with. What, I wonder, caused the inhabitants' change in perception? Perhaps they felt that it had never done or said (love the personification) anything to harm them before they saw the harm that came with Janet's paralyzation...the drying of the spring...the fire. Yet what, or who, was to blame? The more I think about that, the more I'm unable to answer the question. They wanted to blame the mountain, then Janet, but they never blamed the "landlord", or looked to themselves, or even considered that it was all just a natural occurrence of events. Another thing that interested me, which I never wrote about, was the name of Mount Lure. Surely it's just a name, but it's an interesting one. There's lure as in to tempt someone to do something, but there's also the fact that it comes from the Old French word "luere", probably related to the German word "Luder" which means bait. I'm wondering if that mountain, those meanings for its name, have anything to do with what Giono was saying about the hill or nature. Aren't we tempted to tame it? Yet isn't it beyond our grasp? I hadn't thought about this etymological angle before, Bellezza. Makes sense, and leads back to your other question: who or what is to blame? And can we think about experience without assigning blame, or causation? This notion of ascribing blame is so interesting, especially in light of the villagers' proposal to kill Janet. As you and Dorian have noted, there seems to be a questioning of just how people should deal with events beyond their control, how we - as Dorian puts it - can simply confront experience and make sense of it. One of Janet's chief criticisms of those around him is that they don't understand anything, that they have no perspective on what it takes, for example, to make a tree. And in the great epiphany of Gondran, his realization that everything is alive, this "lit-up world" he can now see - he recognizes that Janet is already aware. I love your comment on Giono's language and your puzzling out "Lure." I have no doubt that, though the mountain's name preceded him, Giono was attentive to the possibilities of suggestion in the word. The more I rummage around in Hill, the more I'm convinced that Giono is extraordinarily attentive to his word choices and to their multiple resonances. It seems in the novel that the ability to ascribe blame depends upon occupying a position of power. The human element appears to have the upper hand when it rejects the notion of a moving, live force beneath its feat but loses that ground when nature asserts herself as we see ourselves as people fret over more current concerns like global warming. They can lay blame on Janet and threaten his life as he is dying and unable to physically combat them. His assumed spiritual ties to the natural elements is his real source of power but it cannot exist without his own human life force. Such an incredibly interesting and rich read! I am definitely re-reading when time permits, and have plans to read Song of the World and Joy of Man's Desiring as Abram recommends. I love your comment about power, Frances. I'm curious, though, about the malice that the villagers ascribe to Janet and to his refusal to help (or maybe it's just a refusal to provide easy answers), and I'm especially intrigued by the connection of this real or perceived malice with language. The villagers, at least Jaume, seem frightened by the ability of language to construct the world for them, and I even wondered, at a stretch, and given both Giono's Italian roots and his war experiences, whether there might be in this theme some subtle warning about the power of demagoguery of the sort Mussolini had begun to wage in the years just preceding Giono's writing of Hill. Such high-flung speculation aside, it's a good question: just how malicious is Janet, and how much of that is just the villagers' scapegoating? 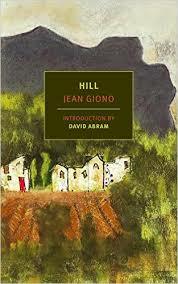 What I loved in this novel is Giono's own refusal to provide easy answers. Janet's crazy anger seems both cruel and justifiable. Scott, I missed this read-along and would have joined had I enough time for a shortish yet rich book based on what you outlined here, rich in theme and lyrical prose. The environmental ideas were inviting. Add a touch of the apocalyptic and I'm sold. I've taken note of Giono (and Ramuz) as a writer of deep ecological and cultural sensitivity, one well worth exploring. Thanks, Rise - I wish you had been able to join (it's really not too late! ), especially as I think Giono's attention to earth and environment would appeal to you (he even set up a sort of commune dedicated to pacifism and ecological awareness). Definitely a writer worth exploring; I plan to keep doing so. Scott, I've finally had the time to sit down properly with this remarkable little essay on Hill. I read it before, of course, but I was going quickly-and what you say here really bears re-reading. Every paragraph is filled with lovely insights. As is my wont, the ones based on close reading strike me the most. I hadn't noticed the descriptions of Janet likening him to wood. Do you think we are then to connect Janet with the forest fire, via those descriptions? In a way, he is burning up, just as he forest does. And both conflagrations almost destroy the village. Since I only read the translation, I wasn't in the position to pick up on that terrific singling out of "deparler" as a key word here, and I totally agree with the conclusion you draw from it: that language gives us both the ability to control and destroy the world. I was so struck by Giono's simultaneous recognition of, on the one hand, the generative power of language & culture & human life more generally, and on the other of the complicity (maybe inescapable) of that culture in the despoliation of the earth. Last thing I'll say about your piece is that I really enjoyed how seemlessly you wove biography and literary criticism together. Maybe you should ditch everything and write the Giono biography the world clearly needs. I think this read-along worked out pretty nicely. Thanks for running it with me. Dorian, thanks so much for the kind comments, and above all for proposing this group read. I have to say that I found Hill electrifying and invigorating after a period of reading many good books that nonetheless failed to generate much excitement for me. Obviously I'm still riding the Giono wave, and am well into a re-read of Que ma joie demeure already. I hadn't connected Janet's "wooden" qualities to the fire, but you do it so nicely above. He's at least twice compared to a "wooden saint," but I appreciate Giono keeping his "sainthood" so ambivalent. Ha, no, I'm not the person to write a Giono biography, but it was certainly convenient to have a few good biographical details in the French edition! I haven't yet looked for a bio, but am sure there's something out there, in French at least. Thanks again! Scott, above please find the link to our thoughts on Hill. Thanks for leading us on this read-along!